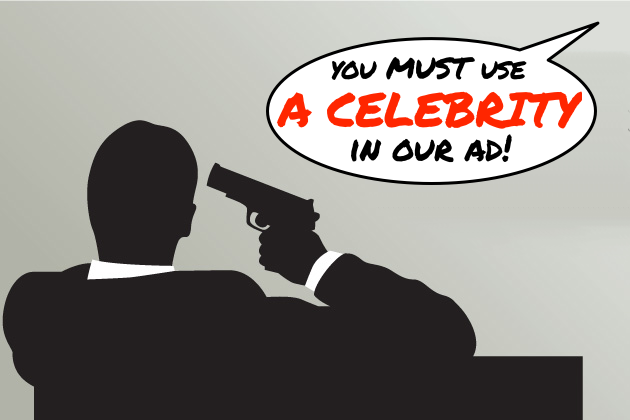 Using celebrities in advertising: does it pay off? This is what we want to do when clients tell us they insist on having celebrities in in their ads. We advertising agency workers hate, hate, hate, hate it when clients mandate us to use celebrities in their ads –even before everyone agrees on what the real problem that needs to be solved is. As a strategist, I personally abhor this “putting the cart before the horse” thinking habit. My colleagues from the creative team feel using celebrities will castrate their creativity. Suits don’t usually look forward to wheeling and dealing with celebrities and their entourage. Signing up celebrities to endorse a brand comes with a certain price tag. The more famous or in demand a celebrity is, the higher the price she will command. This means using celebrities in advertising is a relatively major investment. Assuming they behave rationally, clients will only invest on celebrities if they believe it will “pay off”. To reinforce this belief, many of them will point out how obsessed Indonesians are with celebrities –look at those high-rating infotainment shows on TV! Do we have evidence to support the belief that “using celebrities in advertising pays-off”? Unfortunately I don’t have specific data for Indonesia. I don’t know if any local advertisers have done rigorous undertakings to validate this. Even if they have, they probably will not share it with me. I also could not find open-access studies that measure the impact of celebrity endorsement in Indonesian market. What I’m going to do here now is to put forward literature from the industry about the effectiveness of using celebrities in advertising. I get them from Warc.com, a global online database of ideas and evidence in marketing. The data and evidence that I got are not specific to Indonesia, but I believe it’s possible to intelligently extrapolate. I will try to answer the following questions: Does using celebrities in advertising really work? If it’s not always the case, what’s the best way to do so? Does using celebrities in advertising really work? Does it pay-off? To answer, let’s be clear on what we mean by “work” and “pay-off”. There are two ways to assess if an advert “works”. Firstly is by seeing it’s immediate effects to the viewers. In this case, the discussions revolve around whether the ad is noticeable, enjoyable, or emotionally-involving enough for the viewers. Can the viewers recall from which brand the ad is? There is very little overall difference between the performance of ads with celebrities versus those without. Ads with celebrities tend to be slightly better enjoyed than those without. In some countries (notably US), ad with celebrities are more emotionally involving. Yet this is not the case in countries where celebrity ads are more common –I extrapolate this is what happens in Indonesia. In Japan, viewers can’t really recall from which brands the celebrity ads are. The study estimates this is because there a celebrity usually endorses so many brands. Again, I extrapolate that the same thing happens here in Indonesia. From this perspective we can feel that using celebrities in advertising doesn’t guarantee success when measured by immediate effects on viewers. But what about their impact on business? This leads us to the second way to assess advertising effectiveness, i.e. by measuring its business effects. Business effects don’t only mean increasing sales result. They also include growing or defending market share, increasing market penetration, increasing consumer loyalty, etc. So using celebrities in advertising does pay-off. Nevertheless, this study comes with a big caveat. The study made and tested the model based on celebrity athletes in US, where sports fandom is a huge part of culture. This is something that we don’t have here. Only very few athletes become celebrities in Indonesia. Does this mean ad agency people’s reluctance to use celebrities in adverts is unjustified? Well, not so fast. IPA Effectiveness Awards database is filled with winners, the elite group of highly profitable advertising. There are also winning adverts that don’t use celebrities, and there are celebrity ads that don’t belong in this database. For the latter, there are two possible explanations: some celebrity ads are simply not effective, or that some are actually effective but their case studies are not submitted to effectiveness awards. Therefore it is misleading to conclude that merely using celebrities will make adverts effective. So what makes an advert effective to bring intended business effects? Combing through the database of effective advertising, it turns out that the best predictor of advertising effectiveness is fame and emotional responses. What makes fame campaigns? Featuring famous people in them is not one of the characteristics. They elicit intense emotional response, high levels of happiness (elevation, awe, or bliss) and some surprise. They don’t rely on language to generate emotional responses. They often use humour, but don’t rely on it entirely. They don’t feel like “typical ads”, more like sponsored entertainment. They are very memorable and distinctive. But if they are pre-tested, they will score low on rational measures like relevance, persuasion, and intended purchase. In short, an ad becomes a fame ad if it triggers intense positive emotions and has some unexpected elements that are surprising, so that people will start talking about it amongst themselves. Thus, a celebrity ad is more likely to pay-off if it becomes a fame ad. This means the celebrity in the ad must be used in such a way so that the ad elicits intense positive emotional response and contains unexpected or surprising elements. Since people generally have some perceptions about celebrities, it’s actually easier to twist them in the ad to make it surprising and entertaining. In these ads, we see a consistent creative idea: Nespresso is so great that it even outshines the gorgeous Clooney. This idea plays with public’s perceptions on Clooney, twists it to make it unexpected, charming, and enjoyable to watch. Using Clooney paid off, as the ads helped Nespresso to exceed its business targets and won a gold medal in an effectiveness award. The best way to ensure that using celebrities in adverts will pay-off is by making him or her “a servant” to the creative idea. The creative idea should be “the master” that drives the ad to be emotionally powerful and unexpected. This is not unlike the process in movie production: we start with a screenplay or a story that ideally drives the casting decisions. If the idea is primary and the celebrity is secondary, then clients can actually save a lot of money not by signing up overly-used celebrities, but by demanding the agency to produce a powerful creative idea and execute it well. To sum up, dear clients: using celebrities in your advertising may give you a head start in terms of ad awareness (not necessarily brand awareness) or noticeability. But if that celebrity does not run properly, and she is burdened by wearing too many logos from other brands, another ad powered by a brilliant creative idea will surpass and beat her on the race of effectiveness. Millward Brown Knowledge Point, 2007, What are the benefits of celebrity-based campaigns? Wood, O., 2010, Using An Emotional Model to Improve The Measurement of Advertising Effectiveness, Brain Juicer. ← Adakah cara yang “lebih benar” untuk berwisata? oh and another thing Nespresso is served at Die Stube Kemang. It’s not bad, just found out the ads are cool. Nice one Mita. Simple way of expressing is that you need to be celebrity agnostic. Treat celebrities as one more possibility in the executional Smörgåsbord. Never lead or conside rthat celebrities are an ‘idea’ in their own right. Terima kasih banyak Mbak Mita. Ini seperti mendapat jawaban doa untuk orang awam.. Slama ini soalnya saya bingung dan (bosan) mengapa semua iklan seragam menggunakan AgMon utk tiap produk. Impressive Reading and a thorough understanding of business.. As many of Ad agency people still focus on making an Ad that satisfy the clients, This posting should be a must reading for both clients and agencies. However, I do wonder if you’re being entirely fair to these (celebrity-obsessed) clients? after all, you’ve shown yourself that using celebrities can work (when they are part of the idea rather than just pasted on). So this begs the question, do your Creatives know how to use celebrities effectively? If so, why resist something that clients want and that has proven to work? Nespresso is a good example. Tiger Woods for Nike even better, where he basically was the idea that took Nike from absolutely nowhere to a brand leader in the game. I believe some creatives have intuited the right way to use celebrities. I think my and their pet peeve is when the casting decision has been made even before the clients fully grasp what the problem that they are facing. Things get difficult when casting has been decided, and the celebrity simply won’t or can’t do whatever the idea has directed her to do. As of Clooney in Nespresso ad, I know for a fact that he has the right to veto the script even when clients have approved it. As of creatives need to understand restrictions are needed in making good work, again some already do. At the end of the day, the challenge is how to make more creatives, especially the new ones, understand and practice these wisdom. For me personally, creative leadership that sets certain creative culture is key. Agree with all that. Indeed, a predetermined celebrity is no different really to any other executional restriction: something to be acknowledged and then put aside while the business problem is shifted to a communication solution, with an idea. Then you see how those mandatories – budget, timing…celebrity can help the idea in execution.